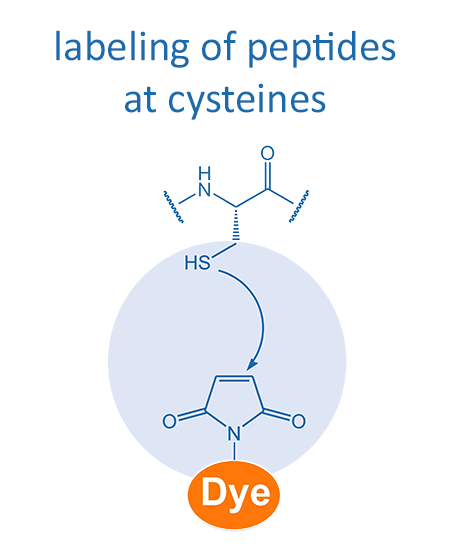 BIOSYNTAN has gained great expertise in fluorescent labeling of peptides over many years. Our portfolio includes various fluorescent labels and different labeling techniques. The thiol group of cysteine and the amino groups of lysine or at the N-terminus are the main attachment points for a fluorescent label. Particularly for expensive dyes, BIOSYNTAN recommends an attachment to cysteine. Typically, the dye is coupled via maleimide functionality in solution, which decreases the amount of dye required. Alternatively, click chemistry can be applied as well. 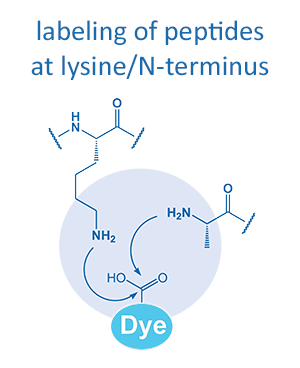 The attachment to amino groups (Lysine/N-terminus) can be carried out for standard dyes, like fluorescein or TAMRA. 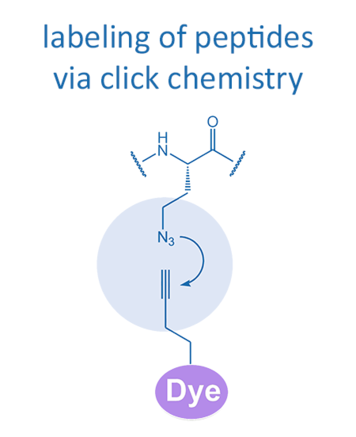 The dye is coupled either as an NHS-ester or directly during the SPPS. In such cases, a greater excess of dye reagent is needed.